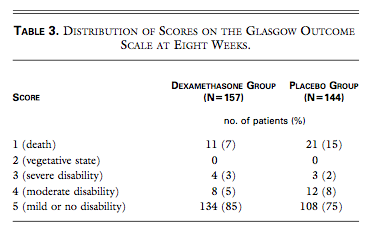 IV 0.15 mg/kg Dexamethasone every 6 hours for 4 days. Give 15-20 minutes prior to the start of antibiotics or at the time of antibiotic administration. Only administration of dexamethasone prior to or at the time of initiation of antibiotics has been shown to produce benefit. Administration of dexamethasone after antibiotic therapy has been shown to have no proven benefit and in one study was associated with wose outcomes. Communication with nursing is recommended to ensure proper timing of medications. Also, the QID nature of dexamethasone therapy provides further opportunities for inadequate and/or ineffective treatment strategies. Baseline knowledge that a repeat dose of corticosteroids should occur every 6 hours is the first step to maximize treatment benefit for these patients. Futhermore, recognize and identifiy that ED length-of-stay for these patient's can typically exceed 6 hours and that the second dose of dexamethasone may be due during the patient's stay in the ED. Finally, physical transition to an inpatient floor and transition-of-care to an inpatient provider provides multiple opportunities for repeat doses of dexamethasone to fall through the cracks. Diligence and enhanced communication with inpatient teams can serve to limit these barriers to therapy. The Evidence: The top two studies looking at corticosteroids in the treatment of bacterial meningitis include a prospective, multicenter RCT published in 2002 and a Cochrane Review metanalysis published in 2015. 1. de Gans et al. "Dexamethasone in Adults with Bacterial Meningitis." New England Journal of Medicine. 2002. 347:1549-1556. Study Design: Prospective, randomized, double-blinded, multicenter trial examining adjuvent treatment with dexamethasone compared to placebo in 301 adult patients with bacterial meningitis. Primary: Glasgow Outcome Scale at 8 weeks. 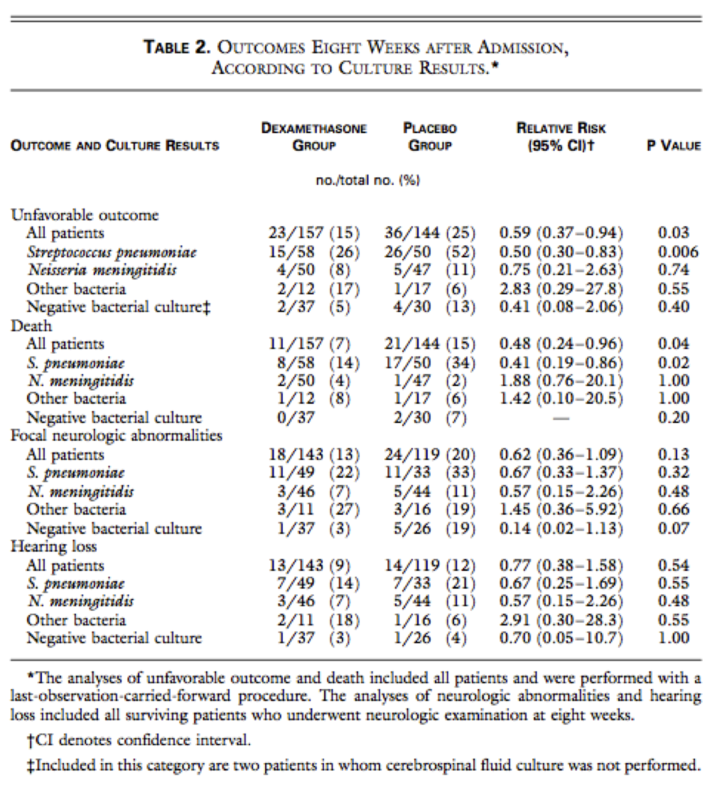 Differences in unfavorable outcome (Glasgow Outcome Scale) and death were only significant when treating Streptococcus pneumoniae bacterial meningitis. No difference when treating other organisms. 2. Brouwer et al. " Corticosteroids for Bacterial Meningitis." Cochrane Database of Systematic Reviews. September 2015. Study Design: Metanalysis of 25 randomized control trials of corticosteroids in bacterial meningitis. Included 4121 patients (adults and children). Four of the studies were deemed high quality with no risk of bias. Author Conclusions: Corticosteroids significantly reduced hearing loss and neurologic sequelae but did not reduce overall mortality.